Beijing, China (178) - Newly released e-readers from Shanda are almost $147.7 below its production cost, targeting at enlarging original literature selling. 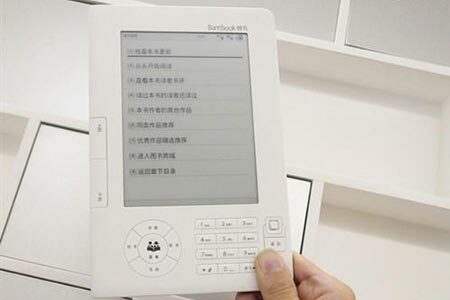 Bambook, a new e-reader released by Shanda, is priced at $147.4, half of the product cost. Everybody who has been curious about Bambook before is shocked by the extremely low price. Since the products of the same functions from Hanvon and Huawei are sold for nearly $443. "This is what we visualized before, and we are betting on the future, not the current profit.”Hou Xiaoqiang, CEO of Shanda Literature told the reporters. According to Hou, the production cost for Bambook is $266. As a content provider which is different from companies making profit through hardware, Shanda is actually hoping to enlarge the number of their readers through this new device they sell. The cheap Bambooks are not what everybody can get, and are only sold to long time users of Shanda. Long time users are users who have registered for more than one year, and have at least $7.39 balance in their account. The price now is only temporary for the first 3500 Bambooks, and the price in the future would be decided upon the original content Subscription profit and the lowered product cost. Fang believes that after the following adjustment in the price, Shanda would go much further in the profit model of Subscription. Analysis from Zero2IPO says Shanda’s entering e-reader market, as well as that of Lenovo and many others, would speed up the process of the price lowering of the future e-readers.